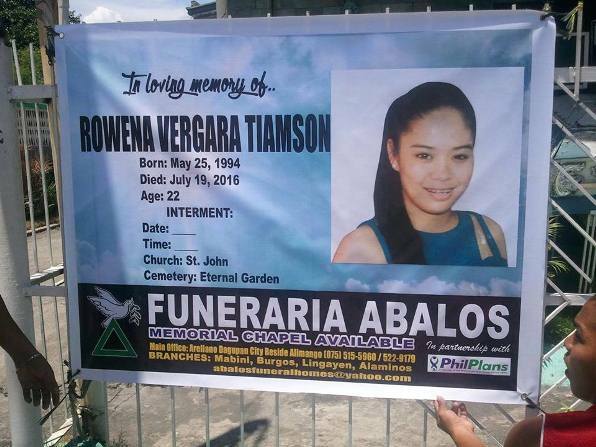 Rowena Tiamson is yet another name in a growing list of seemingly innocent people gunned down in the Philippines as the government and self-proclaimed death squads intensify their campaigns to rid the nation of illegal drugs. Since Rodrigo Duterte assumed the presidency which he won in a landslide manner in May, the spate of killings grew in regularity. The strategy in itself is questionable and disrespectful to human rights. However, the bigger problem is the fact that innocent people are getting caught in the crossfire. Some people end up dead in ditches with tapes over their mouths even though they haven't been proven to have done anything illegal. This brings us to the case of Rowena Tiamson. At the time of her untimely demise, Tiamson was only 22 years old. According to friends and relatives, Rowena is a kind and responsible young lass. Proof to this is the fact that she is a consistent honor student in school. She was also a member of a local church choir. And she was about to graduate this coming October with a course on Mass Communication. Now that she's gone, she won't be there to pick up her diploma. It's possible that Rowena Tiamson's case is a case of mistaken identity. After all, she isn't on the Philippine National Police's watch-list. Why was she put to the ground? Is there another motive behind the case? Does she have enemies that friends and relatives are not aware of? These are just a few of the questions that need to be answered to get closer to achieving justice for the young woman's untimely demise.